Once again, I come bearing no embarrassing story for you. Maybe my prediction about the purpose of Tuesdays was incorrect. My teaser this week comes from The Shadow of the Wind by Carlos Ruiz Zafón, which I am LOVING (thanks, Karsyn!). At the bottom of the cupboard, I kept an old tin cookie box, a treasure chest of sorts. There I stored a menagerie of useless bits of junk that I couldn't bring myself to throw away: watches and fountain pens damaged beyond repair, old coins, marbles, wartime bullet cases I'd found in Laberinto Park, and fading postcards of Barcelona from the turn of the century. This book has a gorgeous level of detail to it. I might be enjoying the atmosphere even more than the plot! 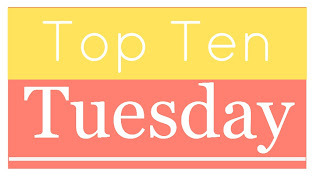 We also have Top Ten Tuesday, hosted by The Broke and Bookish. Today's topic: top ten goals/resolutions for 2015 (bookish or otherwise). Ugh. I hate making resolutions—who ever sticks to them, really? It's like making a list of all the things you plan to fail at in the coming year. (Ahem. My inner Negative Nancy is showing.) On the flip side, it might be fun to write down a few things to aim for and see, come December 2015, how I did. No pressure. Yeah, let's go with that. 1. Not worry about meeting a "books read" goal for the year. I made one of these this year and found myself worrying more about hitting it than enjoying my books. I'm not touching the GR challenge in 2015, no matter how much I love obsessively checking my ticker. 2. Not worry about posting on this blog every day. I have enjoyed my daily posting in December, if for no other reasons than flexing my long-dormant writing muscles and establishing my blogging presence, but I anticipate this posting rate giving me grey hair. I hope to post 3ish times per week in 2015. 3. Read more new releases. One thing book blogging has shown me is how many wonderful books get published every year. Before now, I mostly focused my reading on older books, but I hope to include more recent stuff in the mix in 2015. 4. Don't read if I don't feel like it. I'm bad at this, especially since beginning to blog. It runs in the same vein as Resolutions/Things to Aim For #1 and #2. Books are fun and interesting, and I intend to keep them that way. 5. Make more time for me. I'm the type of person who likes to be there for those around me, even at the expense of myself. I don't want to swing to the opposite extreme, but I want to strike a healthy balance between being with (and there for) my loved ones and being with (and there for) myself. 6. Spend more time outside/take more walks. This is basically impossible until May, but I want to make an effort in the late spring and summer. Why coop myself up when I'm forced to do that for six months out of the year anyway? 7. Bake something new and challenging. Eclairs and/or Boston cream pie, I'm looking at you. I sat and stared at #8 for a while until realizing that I don't want to write anything halfhearted. Seven resolutions/things to aim for it is! This should keep me plenty busy. Do y'all have 2015 resolutions? Do you dislike resolutions as much as I do? Want to tease me with your Tuesday read? Link me to your memes! P.S. Vacation has made me rather slow on the comment response front. I promise I'm not ignoring you! Just out enjoying my last few days of freedom before the new year begins. SO glad you are loving SotW. It's so great! Will you read the rest of the series? I loved both of the other books, though I enjoyed 3 a little more than 2. Totally with you on the yummy food front! I'm not sure how much my diet will change, since I tend to eat a pretty good mix of healthy foods and treats, but I'm making it a priority to get more exercise in. Rather than being due to appearance concerns, it just keeps my head twisted on straight. No worries on the reading goal stress—it's just how my brain works! :) I'm looking forward to going into 2015 with a clean reading slate and going where the books take me. On that note, I saw you have The Paper Magician on your TBR. DEFINITELY check it out! It's a pretty big departure from what I usually read, but it's been such a fun diversion over the last 24 hours. I think it has enough action to keep you going through the slower bits.